It's been nearly three years since Edmonton-based singer-songwriter Marlaena Moore released her sophomore album, GAZE, but she's not without her reasons. As the folk, pop and rock-blending musician and her band prepare to head into the studio in March to work on a followup, she tells Exclaim! that the wait has been deliberately engineered. "I'm striving to be very eclectic, trying to make every single song sound very different," she reveals. "The thing that's been really exciting about this release is being very deliberate with everything, and not trying to force it out immediately." Moore has spent the past year demoing new material and jamming with a variety of local musicians in order to both expand her palate and refine her ideas before her studio time approaches. 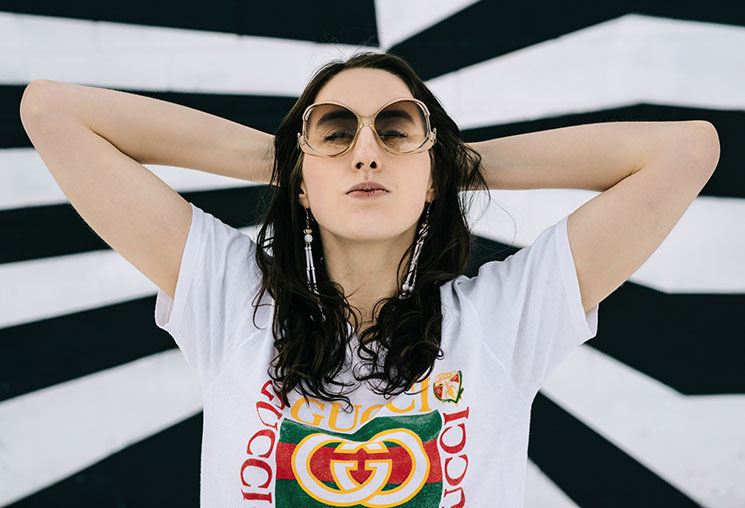 Having been performing in the city since she was a teen, Moore, now 25, is giving herself the preparation she needs to tackle what she intends to be her most ambitious album to date. "My favourite record of the Beatles is The White Album," she reveals. "Every single song is totally different, and that's what I'm really striving for with this new record, and I'm very excited about that," she explains. "I'm getting to add a lot of elements that I've always wanted to add to recording, but never had the opportunity before to, like [a] wider range of instruments, including some orchestral cello and trombone and stuff like that. And kind of going back to my initial influences, and being able to draw upon those and make the recordings that I've been wanting to make since I was 16." Cutting her teeth in the Edmonton scene with punk trio the Sweathearts, Moore went solo after the other members moved to different cities. She dropped her debut album, Beginner, in early 2014. Pieced together from songs written and recorded throughout her teenage years, Moore found herself dissociating from the album shortly after its release, which led to her quickly conceiving and recording its followup, GAZE, which she released in 2016. "I really, really wanted to get GAZE out there because I was losing touch with Beginner. I wanted to get something out that I felt really good about, that I wanted people to associate with me more," she reveals. "Those are songs that I was writing when I was 14 to 18. I didn't really have the wherewithal, the experience to really know what I was doing." But, she admits, there was something magnetic about the conceptual sprawl of Beginner, in contrast to the hurried focus of GAZE. "I'm the eternal overthinker, daydreamer, I love everything," says Moore. "Listening to tunes, just collecting pieces, I just want everything. I love really beautiful music and I want all my tunes to reflect that and so it's the eternal little kid of wanting everything." According to Moore, the biggest lesson learned in the interim that makes her more confident heading into making her third record is how to work with collaborators, stemming from working on GAZE with Edmonton-based retro-popster Renny Wilson, who recorded the album. "I am kind of a stubborn person in a lot of ways, and when I was a young teenager writing all these songs, I was very resistant to any sort of collaboration, or anyone giving their opinion. That's what being 14, 15 is, for everyone," reflects Moore. "I had the notion that in order to be integral as a musician, you have to stick to your vision no matter what, and that's just not true, fortunately." Another way Moore has matured over the years is in her lyrics. "The thing I've realized about myself is that I'm not really a storyteller, in a lot of ways, even though I eventually want to be more like that. I completely draw from personal experience and almost don't really know how to not," she says. On how her perspective has grown and evolved over time, Moore points to the topic of love in her lyrics as proof. "In the recent album, a lot of the songs are about dealing with mental illness while being in a very serious relationship, my first long-term relationship, and the complexities of that. "The thing that's been really cool that I've been finding different with everything is the last two albums were really about a lot of the songs about wanting for love, pushing for love, all that, lovely, overly romantic stuff, and with these songs, the reality of love, when you get there, what happens, and maybe it's a little different than you thought it was gonna be." With lyrics informed by life experiences and a more open collaborative mindset, Moore is as ready as she's ever been to work on her latest album. "Right now," she says, "I'm hyper-focused on recording and making that the best I can be. And after that's finished, then who knows." Marlaena Moore plays the Buckingham in Edmonton on January 17 as part of Exclaim! 's Class of 2019 concert series.